Free Kindle Reading AppAnybody can read Kindle books—even without a Kindle device—with the FREEKindle app for smartphones, tablets and computers. printed and dispensed by Lulu Enterprises, Inc.- 860 Aviation Parkway, Suite 300- Morrisville, NC 27560- U.S.A. Poems by the Italian poet Guido Pagliarino(Award of Culture by the Chairmanship of the [Italian] Council of the Ministers, 1996); they are writed by the author in English and in Italian. Unfortunately, poems are not exactly translatable into another language. Here have just two examples: 1) Poem "My Friend": In Italian language, this poem is hendecasyllabic, however it was impossible to me to keep this metre in English language and, at the same time, to obtain the exact, original meaning and a correct English syntax; therefore, in English this poem of mine is not hendecasyllabic. 2) As regards the English word “dawn”, we have two terms in Italian: “alba” (when darkness is surrendering to the light) and “aurora” (when the sun is on the way to rise and one can perceive the first, weak light). The title of one poem of mine that you will find in English section, “First Easter Dawn” – on the Resurrection – is different in Italian language, it’s “Alba ed aurora di Pasqua”, like “Easter Alba and Aurora”: very important title by reasons that one will be able to understand reading that poem. I think that the translating imitation is better than the real one for kind of poetries or some part of their verses. As a rule, my poems in English language are not real translations but just imitations of my Italian poems. "My Friend" is an exception, because, on translating, I have preferred to focus on the exact content..
Purtroppo, le poesie non sono traducibili esattamente. 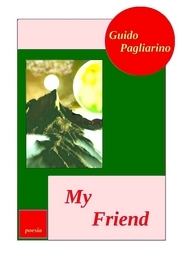 Si abbiano solo due esempi: 1) In italiano, il poemetto “My Friend” – L’amico – è endecasillabico, tuttavia mi fu impossibile mantenere questo metro in inglese e, contemporaneamente, ottenere il preciso senso originale e una corretta sintassi inglese, per cui in tale lingua questo mio poemetto non è in endecasillabi. 2) Per quanto riguarda la parola inglese “dawn”, in italiano abbiamo due termini, “alba” (quando il buio sta arrendendosi alla luce) e “aurora” (quando il sole sta per sorgere e si percepisce la prima, debole luce): il titolo di una poesia che troverete nella sezione in inglese, “First Easter’s Dawn” – sulla Risurrezione – è diverso i n italiano, è “Alba e aurora di Pasqua”, titolo ch’è importante per le ragioni che si potranno capire leggendo tale composizione. Penso che sia meglio l’imitazione della traduzione relativamente a certe poesie o a qualche loro verso. Di regola le mie poesie in inglese non sono traduzioni ma imitazioni di mie liriche italiane. “My Friend” è un’eccezione perché, nel tradurre, ho preferito privilegiare l'esatto contenuto.